The sirens of Greek mythology, dangerous creatures with the heads of women and the bodies of birds, were three in number (just like the stanzas of this poem) and sat perched atop a cliff luring sailors to their deaths with song. Their victims either crashed against the rocks and drowned, or starved to death on the beach, unable to do anything but listen to the song high above them. The exact nature of the song has never been known, but it’s commonly thought of as an irresistible call to the loins (a siren song being what it is). Canadian novelist, poet and environmentalist Margaret Atwood re-writes the song so it traffics in sexual roles but is not primarily sexual. Her siren uses what we’d think of as an outmoded version of femininity—me so helpless! you big strong man!–to draw the chumps in. Before reading this poem, I pictured Angelina Jolie in a toga singing and snarling at Brad Pitt as he falls back braindead from a collision with the cliffs, but Atwood reminds us that the siren is only half human. 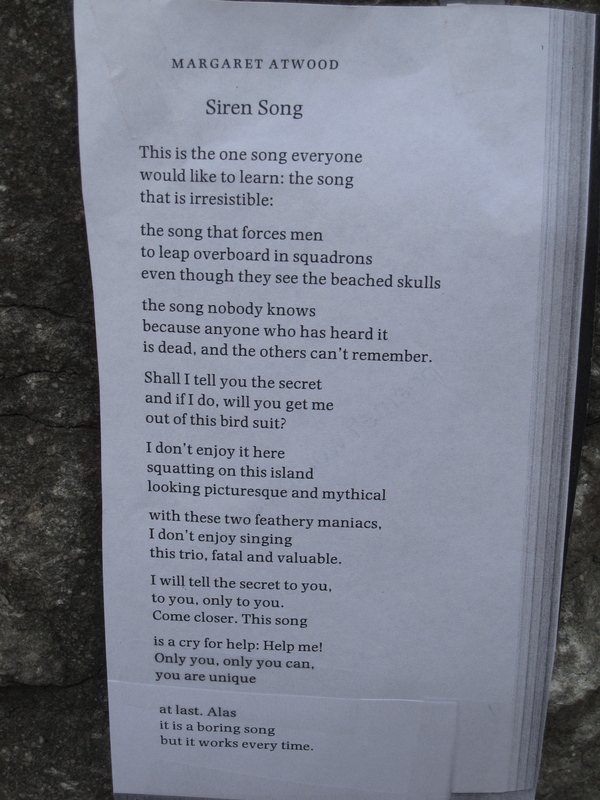 The poem emphasizes the siren’s avian half—she wears a bird suit, squats, has feathers, and even sounds like a bird warbling: to you,/ to you, only to you. Bird imagery can be used to demean women: calling women “birds” as though they’re prey or of limited intelligence; describing women’s talk as squawking, clucking, or henpecking; referring to a roomful of women as a henhouse—and Atwood uses those belittling associations to remind us of how gender stereotypes can limit women’s roles. The poem’s siren feels trapped in her role and wants to get out but lacks the will to change. She’s very clever here and almost seduced me. She complains about having to sing the same old boring song and asks for help in escaping. This complaint and appeal for help IS the siren song. You think she’s about to tell you (you, her reader, become a character in the poem, the sailor she addresses) the secret of the siren song, but she’s already pulled you towards the deadly rocks. Coincidentally as I was posting this blog, I finished reading an analysis of the costumes and characters in the HBO series Mad Men. (I’ve never seen the show before, but after reading this blog I’m familiar with the major characters and basic plot lines.) It’s a fascinating read. Mad Men takes place in the early 60’s, ten years before Atwood wrote “Siren Song,” but gender expectations don’t seem to be that different in the two worlds. In the TV show, the women are reigned in and defined by what they wear which is almost always a dress. I kept thinking how silly and overdressed I’d feel if I had to wear clothes like that all the time. From what I can tell from reading this blog, the women’s costumes dictate their actions, hem them in, and proscribe their roles. The roles frustrate the female characters more often than not. Atwood’s siren has me thinking of Mad Men’s Betty Draper. No one on the show dresses more beautifully, but no one watching the show would want to be her. Her beautiful ensembles make her an accessory, a plaything, a helpmeet, and she wants more. She just doesn’t know what it is she wants, so she keeps playing her part, depressed, drinking and deadened. The siren, too, wants something different—get me out of this bird suit, she begs. She doesn’t like her costume, her lines, or her role, and yet she keeps playing out the same game. It’s all she knows. She’s restless and unhappy, but unable to stop pretending to be helpless and destroying those who come to her aid. I suppose we all, male and female, can get trapped in bird suits. A bird suit doesn’t have to be a gender stereotype—it can be any expectation that makes us act smaller than we are. I thought I outgrew being the quiet awkward one in high school, but in some situations—when I’m with a Joan Holloway type of woman (another Mad Men character), for example—I can go right back to dork-dom. With certain men I feel ashamed of my lack of “feminine charms” and try my best, even as I’m disgusted with myself, to please. That kind of self-loathing is at the heart of this poem. 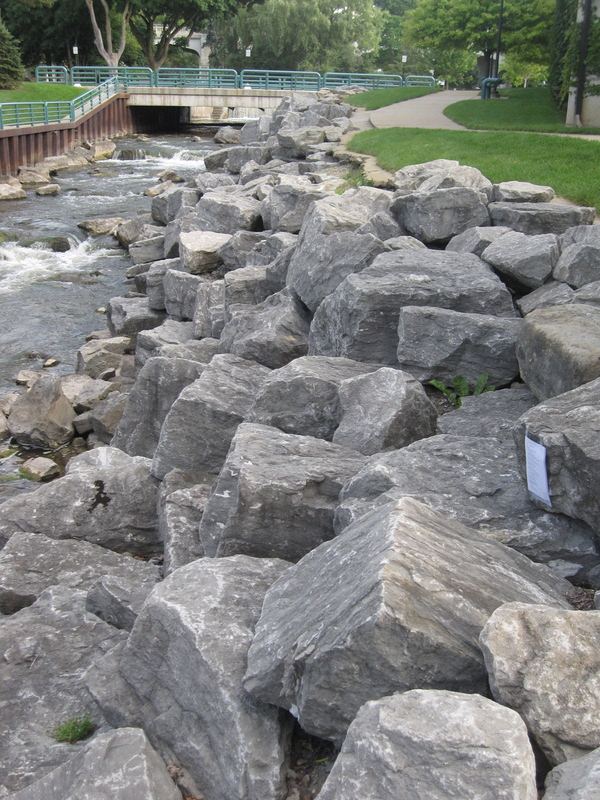 I taped “Siren Song” to a pile of rocks on the bank of a little river, not to make it dangerous to reach, but so that anyone who wanted to read the poem would have to step off the footbridge and squat on the edge of a boulder. My little joke, a nod to Atwood and the wry humor of this poem. *For a completely different take on sirens (but also written in 3-line stanzas), read Sylvia Plath’s “The Lorelei,” written twenty years before “Siren Song.” Plath sees the singing women as “goddesses of peace,” showing her fascination with and longing for death and the peace it brings.